← [vacancy closed] Who wants to share a hotel room with me for the NRA Convention? 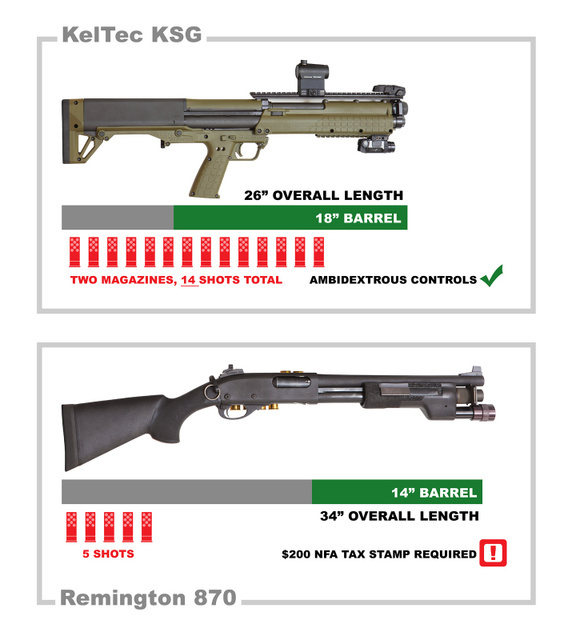 This entry was posted in shotgun, weapon and tagged 12ga, bullpup, comparison, infographic, keltec, pump action, Remington. Bookmark the permalink. But I can actually go buy a non-NFA 870. There are at least 5 places within ten minutes of me that have them sitting on their shelves. The Kel-Tec doesn’t exist in the real world. And won’t for many years. KSG интересен и привлекателен, спору нет. Только вот как с надёжностью функционирования его усложнённой механики, и со служебной прочностью? И ещё хотелось бы понять, насколько быстро его можно зарядить. We have a few on order for T&E. I’ve got money on it taking longer than that first run of Sig 556 rifles. I sympathize with the supply side, but it doesn’t make it sting any less for the consumer. I do own a 20ga 870 Youth which I like reasonably well. The comparison was very much for the CQB and police use. I’d buy one if I had money to burn which I most certainly don’t, so will stick with my Saiga 12. I have to agree – I’ll get the Form approved for any NFA item long before I see a KelTec KSG. Meh. I’ll stick with my Mossberg 500 12 gauage riot gun. Proven design, easy to manipulate and feed. And it probably cost 1/4, or less, than a KSG. There is one sitting about 10 feet from me right now. I really think the KSG is a fascinating product. Like many of Kel-Tec’s products. But they can’t actually make any of them. I doubt I will see a KSG on a store shelf before 2015. There was a KSG at CTD Fort Worth when I went buy the other day to get another AR receiver. Nifty piece of kit. The tax stamp is only $5.00, not $200.00. It is an AOW (any other weapon). It has a stock, so it’s a “shot barreled shotgun” and not an AOW. Yes, you are right about the AOW v. Short Barrel Shotgun — what crazy laws! The 870’s, the 500’s, the 12oo’s, even my 21A, they work. These things, well, look good, but….Optical illusions bedammed, I will try again.